So it's time to release what will hopefully be the final version of Garden of Coloured Lights! It's attached to this post below. I'll do some more testing tonight, though, and if I find anything which needs fixing I'll put up a revised final version tomorrow. Hopefully that will be unnecessary. 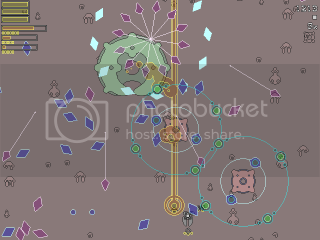 Basically it's a vertical shooter with music game elements (well, the enemies are kind of musical). The options are three weapons you get to choose at the start and upgrade through use as you go along. This version adds Stage 4 and makes many refinements - new features and things are discussed in a post which I'm about to make later in this thread. I've also attached the C source for anyone interested in that. Needless to say version 1.0 wasn't perfect and I've uploaded version 1.01. It fixes a few trivial issues with 1.0. Also, I added two new screenshots. Guess what? Version 1.01 had a few minor issues as well. Incredible, I know. Have a look at the post on page 2 for a discussion of these, or just download the files from here or from allegro.cc. And Garden of Coloured Lights is such an inspiringly AWESOME name on this project of yours, by the way!!! ! That looks really nice! I loved the style of Excellent Bifurcation and the gameplay was pretty damn tight. I'm really glad to see that you're entering. Good luck! Good to see you joining in again Linley. I really enjoyed Excellent Bifurcation so good luck with maintaining your high standard. My man motorherp, I gotta agree with you that Linley’s last entry of Excellent Bifurcation did such an EXCELLENT job at making such a high-wire act of originality *truly* successful with all of the stops already out... and that is part of what keeps this awesome shmup genre alive and kicking!!! ! Looks great, I like the lines on the bullets. Is the little grey object the player? That could be a more interesting shape I think. As so many others have said, those graphics are very excellent...bifurcation-ish. Make this as good as Excellent Bifurcation was. Hey, thanks everyone for the encouragement! I'm really looking forward to seeing all of your games as well. Particularly Cactus' entry... (I especially like those character portraits at the start). I had a great time writing Excellent Bifurcation, but the two-screen thing was really limiting in a lot of ways. 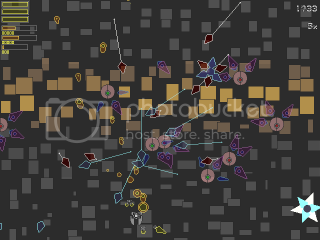 In particular, putting everything on one screen means bullet patterns can be more interesting without also being totally impossible. There were also a few inconsistencies in the graphics which I'm trying to get right this time. The little grey thing is indeed the player. It's animated and now has various options buzzing around it so it looks better than the screenshot suggests, but it certainly isn't fixed. Anything could change over the next couple of months. I'm really looking forward to seeing all of your games as well. Particularly Cactus' entry... (I especially like those character portraits at the start). Thanks, you're definitely on in the top three entries I'm looking forward to most as well. I thought the sound effects and music was excellent for the second level in Excellent Bifurcation. They fit slightly less well with the first, but I think you did the best in this category out of pretty much all the entries I tried last year. I actually quite liked the player sprite. It has the best design of all the graphics I see on the screen, in my opinion. But I quite like the background and enemies as well. 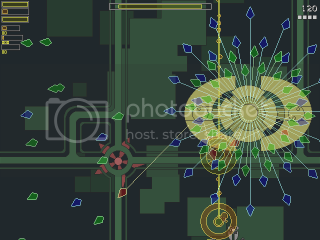 As you can see, the options are there now, as is a new enemy and the bullet from some kind of cannon thing the player has spinning around. Sorry for the lack of updates, but things are going along nicely. Should be a demo of level 1 in a week or so. Then I have about a month to write the next three levels, because I want this to be a bit fuller than Excellent Bifurcation. Expect lots of strange geometrical shapes and weird music synchronised to the fun! That smoking cannonball is cool. Really cool. Okay, as promised here is the first demo of Garden of Coloured Lights (attached to this post). You can play up to the end of the first level, but there's no boss as yet. - I suggest using the standard option configurations at first, but you can also choose any three of the nine weapons. 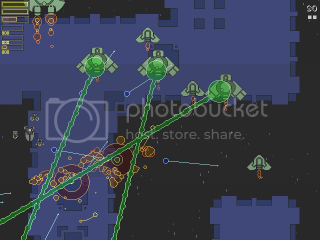 - Use light, fast-firing weapons against small enemies and bigger, slower-firing weapons against large enemies. - Each time you destroy an enemy you gain energy/power/experience/whatever in the weapons you used to damage it (split among weapons according to the proportional of the damage to the enemy they caused). This is represented in the orange bars at the top left. You don't get anything for enemies which escape. - Fill an orange bar and the weapon levels up, becoming more powerful. - System requirements should be minimal. I recommend using good speakers or headphones, because the sound is a pretty important part of the game. Have fun, and let me know what you think! All criticisms/suggestions are welcome. Please be as harsh as you think appropriate. I'd also be interested to know if anyone can't get it to run, as it should run on almost any Windows computer. I really like the audio, very cool. I like the way the enemies move - sitting still for a while and then shuffling themselves. The weapons are interesting, especially the melee-style one - not something often seen in shmups. And getting to choose whichever three you like, excellent. What I really don't like is the delays on the weapons. I don't like how when I shoot a big fireball I then have to wait for it to move off the screen before I can fire my standard fast gun again. It just makes me feel uncomfortable at being denied my main weapon, and conditions me against using the fireball. I'd be inclined to suggest making the three weapons have separate timers, or maybe just make the delays shorter. One of my most favourite entries at the moment. Very nice game! I also found the weapon switching delay frustrating, although I understand the reason for it, to limit the use of the powerful weapons. I'd still get rid of it though, the low rate of fire and slow speed should be enough of a detriment to constantly using the powerful weapons. I also found the non-centered shooting position caused me to miss sometimes. 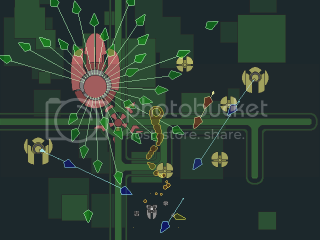 Perhaps you could have the active option move to the center when it's being fired, and leave the other 2 orbiting? Finally - fullscreen graphics mode and analog joypad support would really make this very playable. Keep it up, this is a definite contender for the winner. I really liked the 8-bit chiptune ambient look in the music and sound effects a lot... and this stuff works well, too!! I hope you finish this entry up in time, because it is DEFINITELY shaping up to be one of the serious big winners of this competition already, my man... so take advantage of it all and keep that awesome stuff up!!! !! Okay. I have just now uploaded on YouTube TWO (2) videos of my own original play of this splendid Garden of Coloured Lights demo here, so here we go!!! The first vid shows you a regular No-Miss play from me in the Normal mode (found at http://www.youtube.com/watch?v=HoxoV1Tb4Ww); and the second is a *very* special No-Miss play in the Hard mode using only my sword weapon in this game (found at http://www.youtube.com/watch?v=hqT-Adogtbg). And pardon me please for my double post, too. ! I'll have a look at the firing delay thing. It's there to balance the weapons a bit but it can definitely be reworked. Maybe the light weapons can have a weaker firing more while waiting for the larger weapons to reload, or something like that. Fullscreen will definitely be an option (it already is, I just haven't written the initfile yet). I don't have a gamepad, though, so I might not be able to do this. Adigun: thanks for making the videos! Unfortunately this Internet cafe blocks Youtube so I can't watch them yet, but I'll see if I can get them some other time. If it's possible to no-miss level 1 hard using only the sword I can tell I'm going to have to make it more difficult somehow :). Probably level 2 will have enemies which actively dodge. Finally - fullscreen graphics mode would really make this a definite contender for the winner. As for a minor detail, the explosions look phenomenal, but you still get a feeling that the enemies just dissappear into thin air. Debris or something like that could make them look a bit cooler. That I am, but exploding things usually don't evaporate. Debris is as integral a part as anything else (fire for instance, wether abstract or realistic) when it comes to explosions. Show general stats for kthorjensen. It's giving me an "archive in unknown format or damaged" error when I try to extract it with WinRar. Any thoughts? I use 7zip for everything, works fine. Especially on Japanese .lzh files. Adigun: thanks for making the videos! Unfortunately this Internet cafe blocks Youtube so I can't watch them yet, but I'll see if I can get them some other time. If it's possible to no-miss level 1 hard using only the sword I can tell I'm going to have to make it more difficult somehow . Probably level 2 will have enemies which actively dodge. Show general stats for Observer. Just tried the demo, and my goodness it was great fun! The entire experience could be summed up by the phrase "diabolical attention to detail." Like water torture, designed to make you irretrievably mad by incremental degrees. I like the imprecision of the weapons and the firing delay. That and the way that the pissy little enemies swarm the pink labial enemies, so that they absorb the punch of your power weapon. Likewise, the dull colour of the ship being overpowered by the scintillating globules of death. Very distracting, and very cool. Combined with the fire source continually moving with respect to your ship means that it is very difficult to enter the "shmup zone" - you know, using peripheral vision to guide the ship's movement instead of fixating on it. Most of the time I had no idea where my ship was, and my fate was the whim of Xom. As with most of Linley's games, static imagery can't capture the majesty of the gaming experience. Bugger the screenshots, play the damn game! I look forward to the readme file, detailing the story of 'Garden..' If the other games are any indication, the story will be worth the price of admission alone. The melee weapon, the aurally epileptic music, the opening selection screen: all gold! I started writing this, then got distracted and played it for about half an hour. Oops! I zipped it with 7zip (which seems standard) and the archive seems to be working for most people. Have you tried downloading it again? Like water torture, designed to make you irretrievably mad by incremental degrees. That's the plan, yes. The final version will (hopefully) have four stages so there will be plenty of time for those increments to add up to complete insanity. On debris: I agree that debris can look good, but evaporation is exactly the look I'm going for in stage 1. Stages 2 and 3 will have some debris (although maybe not cactus-like levels of debris). I've watched those videos now... sometimes it's easy to forget how bad I am at these kinds of games and make 'hard' mode hard for me rather than hard for someone who is much better at shooting things than I am. Hard mode is now a lot harder (and yeah, the sword is going to be a bit blunter in the next version). Also, now you can fire while waiting for one of your weapons to reload, although reload energy (for want of a better technical term) is split between all reloading weapons. There'll be at least one more demo before the end date, probably in a couple of weeks. If you look closely at that picture you can see the debris. This is really looking great. Love your backgrounds. I guess another artsy fartsy comment from me. The colors are nice desaturated greens and blues. Looks like all the game elements are from the same artist which is a good thing in tying it together visually. They do all come from the same artist. Linley did the entire game(at least I'm pretty sure). - There is an init.txt file. Edit it (in notepad) for options like windowed/fullscreen, joystick button settings, analogue sensitivity etc. - Weapon balance - are any combinations really overpowered? Are any weapons indispensable/useless? - Any problems running on anyone's computer - is it possible for the judges to test it to make sure it works on their systems? - Graphics, sound, controls, enemies etc. Anything about it at all, really. - I haven't enforced the 5-second wait yet. - lots of fun with palette shifting! If I take three copies of the same weapon and fire them all at once I should be able to fire three times as many bullets. I can fire three at once, which I guess is kind of cool. But then it takes three times as long to recharge. My suggestion, which you are of course welcome to ignore, is to make the weapons charge independently. I think this is a case where something seems like a bad idea to the developer, because it will ruin the carefully balanced ..balance, but would make it more fun for the players. edit: don't completely decouple them, but have them faster than they are now. like, for each additional weapon recharging, 25% less charge is added per time step. Also, I want three swords! But you should definitely ignore this one. edit: finally made it to level 2, and it's visually confusing: the fire/explosions are the same shape as enemy bullets and a brighter colour. I have played both of the demos, and I must say the second one is better. One disappointment's for me was that different weapons did not change the shape of your options. However I did like how the first weapon was attached to your ship. Another disappointingly thing, is that if I pick three of the rapid-fire inaccurate ones, I rip through the popcorn enemies, but I can't even kill the pink enemies that shoot the round spreads of shots. I can do it if I pick two rapid fire ones and one precise shot. Regarding that, on one hand I like it that slower weapons (which are harder to use, especially in tandem) deal more damage/second, but I dislike the fact that the fast weapon has no total killability. This does lead to me wanting to pick a weak weapon for spam shooters, and a nice, strong one for the stronger enemies, making me choose a balanced set instead of an unbalanced one. My gamepad didn't seem to work - I have an Xbox controller with USB adapter using the XBCD drivers, it didn't respond in the menu at all and the calibrate joystick didn't seem to do anything either. However, it worked fine with joy2key. The game looks and sounds great, and the new improvements to the reloading system are good - it feels much more balanced being able to shoot right away, but having to wait longer. I still find that having your shots emit from a moving option makes the game frustrating, because of the long load time on the big guns and the fact that the options are hard to distinguish, so I always choose the riot type as it gets the fixed gun and the sword. I would prefer it if when you held down shoot, the option you are firing with snapped to the front and stopped rotating - until you release shoot and then off it goes again. All those other options are cool looking but I have no desire to play them because of the frustrating aiming. Even if only 1 in 10 of my shots miss, I feel like I was cheated - the game made me miss rather than my lack of precision made me miss. Oh, and the rear-firing seeker one is very weak I think. It might be better if they lasted a little longer before they self-destruct. I also think the player should collide with the enemies. Keep it up, I'm looking forward to going for a highscore on the final version!